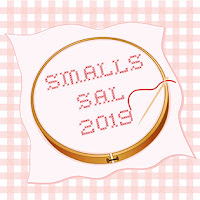 Heather from Silver Lotus has been hosting the Smalls SAL since 2013 when it was The Ornament SAL. 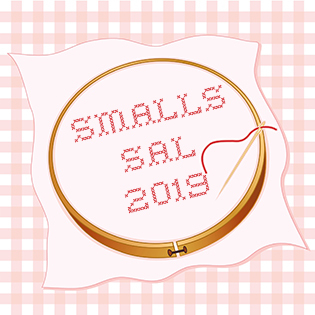 Last year she found she had less time for blogging so when Mary asked if she could host the Smalls SAL this year, Heather gratefully handed over the tiny reins to a new host. The rules are basically the same and can be found on the Sign-Up Page on Mary's blog. It was such a pretty piece of fabric I didn't want to cut it down too much! I started this one on the 11th January, the goal is to finish one every four weeks. That's it for the Smalls, this year is The Year of The BAP. Congrats on the pretty finish Jo. Your ornament turned out so pretty. All the smalls are so pretty. Such a sweet Quaker Tree, it looks great on that page. Thanks a Bunch is lovely too so far. Your Quaker Tree is beautiful. I love how you finished it. I also like the Just Nan Thanks a Bunch - I hadn't seen that one before. What a pretty Quaker tree! And I love every Just Nan you do!! Beautiful smalls. I agree with you about the fabric. Too pretty. Nice pieces Jo! I especially like “Thanks a Bunch”, it’s very pretty! Yes please, I’d like to join in again with the Secret Stitching Sweetheart Blog Hop. More lovely Just Nan stitching. Very nice stitching! I love the way you use scrapbook pages to showcase your finishes! Love your smalls and that scrapbooking paper is divine! One question about the Sweethearts...are we going by European time zone or US or something in between? What a pretty `Thanks a Bunch´ piece. Very pretty tree, Jo! And I always love seeing your Nans! :) So I'm looking forward to more of them this year! :) I plan to be joining the Secret Sweethearts! I love your current Just Nan small. Such pretty Daisies! Also, I really need to get working on my Valentine's stitching - time flies! Lovely finish and nice work on Just Nan! Please count me in for the Secret Stitching Sweetheart hop.